Compact, evergreen shrub growing to a height of 500mm. White flowers in autumn, winter and spring. Perennial. First year flowering. Flat leaves, garlic flavour. Full sun. Ht 50cm. Indigenous. Shrub with dark green leaves with greyish undersides. Creamy flowers from March to May. Perennial. Hardy. Sun. Large green globes, blue protea-like flowers. Full sun. Annual. Large leaves. Strong pesto basil. Full sun. Ht 30 - 40 cm. Annual. Most popular . Large aromatic leaves. Full sun. Ht 50 - 60 cm. High yielding; vigorous, large-leafed Thai type. Spicy and very aromatic. Medium sized round head. Late maturity. Sun/shade. Annual. Medium green sprouts . Sun / shade. Annual. Green blocky sweet pepper. Full sun. Annual. Very hot. Full sun. Annual. Green to red fruit. Very hot. Full sun. Annual. Upright bush. Good for coooking. Full sun. Ballito is an excellent firm, blocky sweet pepper with a thick wall. Yellow fruit. Full sun. Annual. Dark green plants that requires earthing up. Full sun. Thin leaves with a mild flavor. H 15 - 30cm. Full sun. Annual. Early flowering, used in cooking. Full sun. Ht 30-50 cm. Gracefully arching strap shaped linear leaves are light green and emits a lemony fragrance when bruised. Evergreen. Annual. Full sun. Annual. Large purple fruit. Full sun. Italian type with dark purple colouring. Fruits are best used before they are 20-25cm long. Plants grow to about 60 to 75cm and produce 8 or more fruits. Herbaceous, fragrant shrub with blue-grey foliage. Tall blue flower spikes in spring and summer. Evergreen. Hardy. Sun. Herbaceous, fragrant shrub with green serrated leaves. Blue flower sprays in spring and summer. Evergreen. Hardy. Sun. Herbaceous fragrant shrub with greyish green serrated leaves. Blue flower sprays in spring and summer. Evergreen. Hardy. Sun. Herbaceous, fragrant shrub with greyish green serrated leaves. White flower sprays in spring and summer. Evergreen. Hardy. Sun. Upright and bushy. Soft green, serrated leaves. Aromatic. Ht 75cm. Full sun. Herbacious fragrant shrub with grey-green foliage. Light blue to violet coloured flowers in spikes throughout the year. Evergreen. Hardy. Sun. Small opposite, simple, pinnately dissected leaves and square stems. Purple flowers are borne in summer. Herbaceous, fragrant shrub with grey serrated leaves. Blue flower sprays in spring and summer. Evergreen. Hardy. Sun. Compact with excellent branching and an abundance of spikes of dark purple flowers. Semi-hardy. Full sun. Annual. Bib type with pale heart, dark green reddish tinged rosette heads. Long lasting, heat tolerant. Full sun. Cullinaly herb with aromatic leaves. Perennial. Hardy. Sun. Perennial. Grey leaves, pungent mint-like smell. Loved by cats. Full sun. Ht 50-80 cm. Perennial with lavender flowers on aromatic gray foliage that will bloom again if cut back by half after blooming. Hardy. Sun. Annual. Dark green tightly curled leaves, very uniform, subtly flavoured seasoning. Sun/shade. Annual. Tall plants, with plain flat leaves with strong pungent parsley flavour, can be eaten like celery. Sun/shade. Perennial. Reddish green stalks. Cook stalks only. Full sun. Ht 150-200 cm. Annual. Young leaves have pungent nutty-cress taste. Full sun. Ht 30 cm. 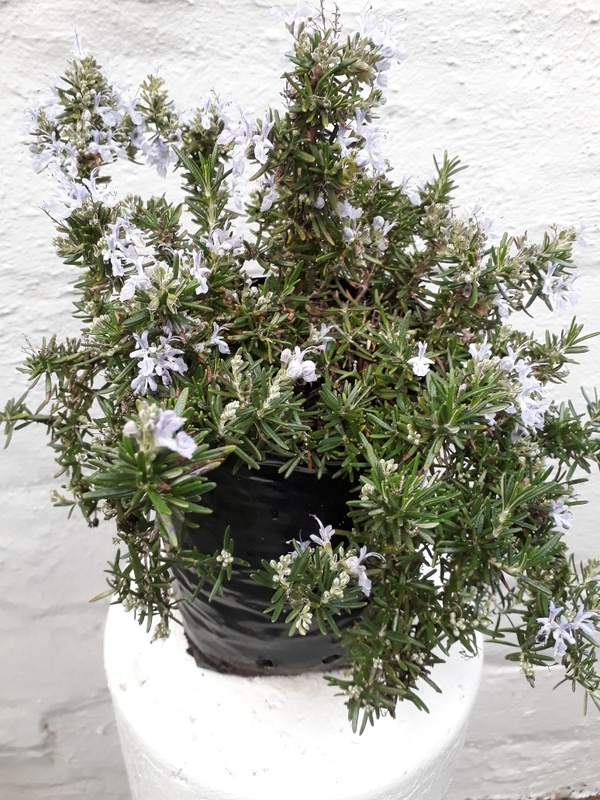 Fast growing, upright rosemary that produces small blue flowers grows up to 120cm. Full sun. Small, herbaceous shrub, with fragrant, needle-like foliage, pink flowers in summer. Drought resistant. Evergreen. Hardy. Sun. Small, herbaceous shrub with fragrant, needle-like foliage. Light blue flowers in summer. Drought resistant. Evergreen. Sun. Hardy compact bushy upright evergreen culinary shrub with aromatic linear dark green leaves. Full sun. Tall variety with clear blue flowers and broad fragrant leaves with a lemony tang. Evergreen. Hardy. Sun. Flat growing shrub, with fragrant needle-like foliage, and blue flowers in summer. Good grondcover. Drought resistant. Evergreen. Hardy. Sun. Annual. Large green leaves. White stalks. Full sun. Ht 50cm. Annual. A mix of red, pink, yellow and orange stemmed varieties with green leaves. Full sun. Ht 50 cm. Incredibly sweet leaves are a herbal alternative to sugar. Bushy, high-yielding plants. Use fresh or dried. An important herb in organic gardening. It is used as a fertilizer and as an herbal medicine. Sun. Perennial. Small broad dark green leaves. Full sun. Ht 20-30 cm. Herbaceous ground cover with small, round variegated leaves and mauve white flowers in spring to summer. Evergreen. Hardy. Sun to semi-shade. Evergreen groundcover with edible dark green leaves and clusters of ros-purple flowers. Drought-tolerant once established. Full sun. Herbaceous grondcover with narrow grey leaves and mauve flowers in spring to summer. Various medicinal and culinary uses. Evergreen. Hardy. Sun to semi-shade. Annual. Indeterminate. Small round red fruit. Full sun. Annual. Indeterminate. Small, yellow pear-shaped fruit. Needs staking. Full sun. Annual. Determinate. Large oblong fruits. Full sun.